It is said that humans, especially indigenous people, are the keepers of mother earth. During a long, centuries lasting process, our relation to mother earth has become weak and we forgot more and more about our duty. Not only that we forgot about who we are and what we came for, but we've also been mislead and isolated, and we've lost the connection to our ancestors. 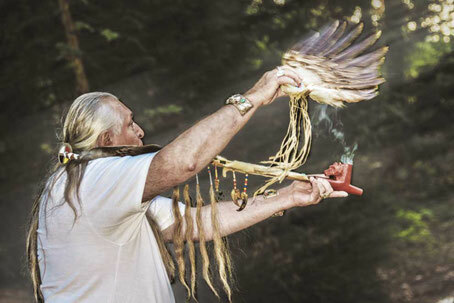 Every nation has its own sacred medicine and heritage. By uniting and bundling them, we can gain back our true power, arising from togetherness, awareness of interconnectedness, and deep pure love for everything that is. We are not alone – we are many! Elders are people who have been nominated by their tribes due to their wisdom (and high sense of responsibility) for representing them and their heritage in strong connection with their ancestors. By bringing Elders from all over the world together, we provide a platform with sufficient time and space for them to sit in a council. There wisdom, visions, ceremonies and views from different tribes are being put together. To bundle their power and energy. To exchange. To develop a common future vision, which in the end will be presented publicly to a great audience. To create a network that sustainably connects the elders and their people amongst each other. Together, we create a change. Together, we create the foundation for the New Era!